Israel’s economy did well in 2017 – will it last? 2017 witnessed several positive developments in Israel’s economy, but a number of trends also highlight the challenges Israel is likely to face in the long term. As we say goodbye to 2017 and kick off the new calendar year, it’s a great time to look back at what has been happening in Israel’s economy during the past year and in recent years in general. A new Taub Center study by Gilad Brand, Prof. Avi Weiss, and Dr. Assaf Zimring shows that 2017 proved to be a good year for Israel’s economy in a number of ways: the employment rate is the highest it has been for years, the unemployment rate is at a historic low, and wages have continued to increase after a long period of wage stagnation. However, the picture isn’t completely rosy. Other areas of Israel’s economy show worrisome trends, particularly when looking at potential for economic growth in the long term. Israel’s GDP (gross domestic product) per capita is expected to increase by 1% in 2017, similar to the rise in recent years, but slightly lower than in other developed countries. Therefore, Israel finds it difficult to maintain a standard of living similar to these countries. In 2017, as in recent years, the main barrier to the growth of Israel’s GDP is the country’s low labor productivity which, according to preliminary estimates, is expected to experience no growth whatsoever this year. Productivity, which measures the amount of goods and services produced per hour of labor, has not risen in recent years. One of the reasons for this is increased employment among population groups with lower skill levels and earning capacity (itself a positive trend). The relatively good state of Israel’s economy is exhibited by a number of positive trends in the labor market; as noted, the unemployment rate is at a low and the employment rate is high. In addition, participation in the Israeli labor market, which had risen impressively since the early 2000s, seems to have peaked this year. While low employment rates in the Arab Israeli and Haredi (ultra-Orthodox) populations could be a source for potential further growth in employment in the long term, another demographic change – a decline in the share of people of prime working age (25-54) as a result, in part, of Israel’s aging population – likely indicates that the current expansion of Israel’s labor force supply is reaching its upper limit. So how good do Israelis have it? What does all of this mean in terms of their standard of living? A major and much-discussed issue that affects the standard of living in Israel is the country’s high price levels. Prices in Israel are higher than expected given Israelis’ relatively low incomes. However, there has been some improvement in this area; over the past few years there has been significant moderation in the pace of inflation, apparently due to the government’s efforts to strengthen domestic competition and ease the cost of living. For example, prices have fallen in sectors like communications and transportation following major government reforms in these areas. Household incomes have increased, and this led to a significant increase in private consumption, without a decrease in savings rates. 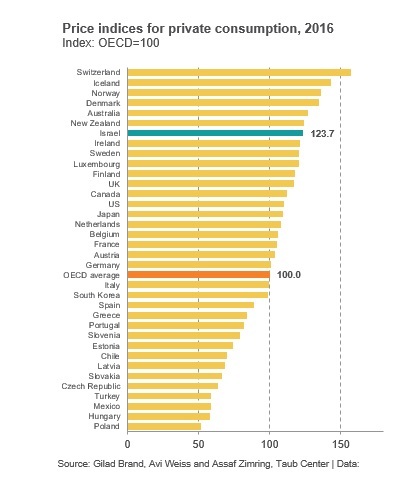 However, despite such improvements, Israeli price levels are still among the highest in the OECD. Furthermore, it seems that employment levels are reaching their peak (as discussed above) and that the rise in wage levels is due to an increase in consumption prices, and is not accompanied by increased productivity. This raises concerns that the rise in private consumption may not persist, and that Israel will need to look to other sources in order to close the gap between Israel’s standard of living and that of other developed countries. An area that is particularly high on the public agenda is Israel’s housing market, given that the past decade has witnessed the development of a severe housing crisis. Apartment purchase prices have increased more rapidly than rental prices, and the gap between the two has been widening since 2009. Part of this gap is due to falling interest rates (which make mortgages cheaper and investments in apartments more profitable). However, since interest rates have remained at their current level for the past two years, it appears that the recent rise in housing prices mainly reflects expectations of households and investors that both apartment prices and average rents will continue to rise in the future. Overall, what we can conclude at the end of 2017 is that the Israeli economy has generally grown and improved throughout the year, but when zooming out to look at the long-term trends, many economic challenges loom in the future. The current positive state of Israel’s economy provides policy makers with an opportunity to address these challenges. This interlude can be utilized to implement policy informed by long-term trends and projections, to ensure balanced growth in the future and to achieve optimal realization of the Israeli economy’s potential.